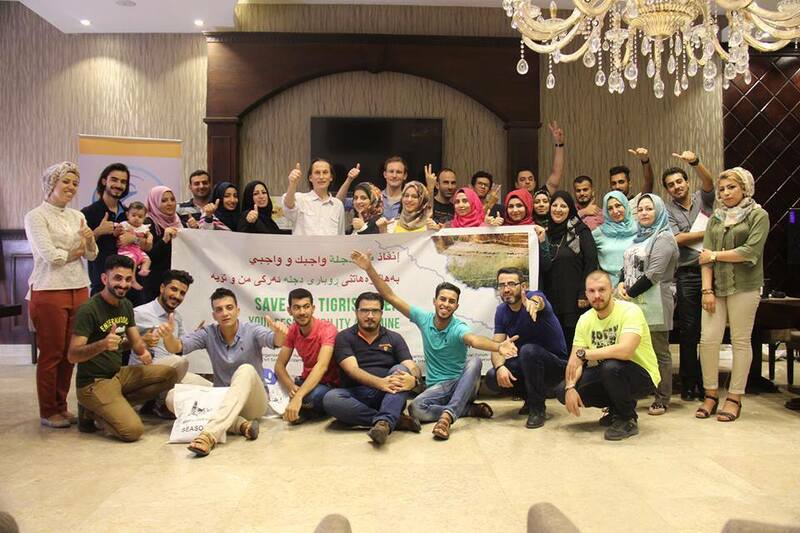 [:en]Protecting the Tigris River of Iraq: this will be the main objective for a new group of committed youth activists from Baghdad and Southern Iraq as they developed plans to support of the Save the Tigris Campaign. During a training in Erbil from 26-27 June, they discussed together with other Iraqi as well as international activists the urgency to protect Iraq’s water resources and to spread awareness on this issue. Despite logistical obstacles (security, visa issues) and uncertainty over its location, over 30 motivated volunteers traveled from Baghdad to Erbil, where they gathered with international activists of the campaign and activists from the Kurdish region. This group of young volunteers will work in addition to the group of activists “Humat Dijla” that have been active in Southern Iraq since last year, next to our Iraqi Coordinator who has been in place since this year. Volunteers registered through an online form – more than 200 registrations were received! – and came from various backgrounds (ministries, environmental engineering, NGOs, activism). A notable share was already well immersed in the campaign, the issue of dams and protection of the Marshes. During the first day of the training, the aim was to familiarize the participants with the campaign, anti-dam movements and civil society in Iraq. International campaign members, water activists from the Kurdish region and activists from Southern Iraq gave talks about their experiences. Volunteers were able to interact with activists and put forward any questions. The second day was very much interactive. Engaged in a deep discussion with eachother the volunteers gained a good insight in how they can collaborate together to protect the Tigris river and how to pursue a strong campaign in Iraq. This was followed by the creation of working groups, during which the volunteers created a list of possible campaign activities in Iraq. A discussion was held during which recommendations were put forth. Together with all other participants including the internationals and the Iraqi Coordinator, the proposals of the working groups were merged into a concrete list of possible activities to be organized by the volunteers in the next months. Many of them expressed strong commitment and the necessity of continuation after the training. During the workshop, ties were strengthened with old and new partners of the campaign, such as Al-Messala and Waterkeepers Iraq. In turn, the young volunteers got to meet the campaign partners in the Kurdish region and get to know their work on water issues. The training was followed by a 2-day fact-finding mission by the international activists of the Save the Tigris Campaign to the governorates of Sulaymaniyah and Halabja. The mission was organized by Nabil Musa of Waterkeepers Iraq, who is now established as a partner of the campaign in Iraqi Kurdistan. Since the Save the Tigris Campaign is increasingly looking into the issue of Iranian dams which will have a big impact on Iraq, the activists visited the Sirwan River, which will receive reduced water flows once Daryan Dam in Iran is in operation. Other (dam)sites were visited as well – a detailed report is to follow. The participants strongly expressed the value of such a fact-finding mission, since they were able to see the reality on the ground and get a clear picture of the current state of the rivers in that part of Iraqi Kurdistan.